Softwood cuttings. Japanese maples (Acer palmatum) are small, deciduous trees grown for their graceful habit, autumn colour and beautiful foliage which may be coloured or deeply dissected. Hard Landscaping. 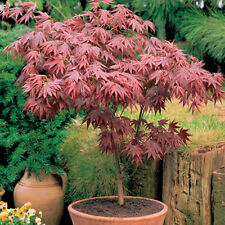 Species:Palmatum Atropurpureum. Beechwood Nurseries are based in N.Ireland and have been growing plants since 1997. Dig a hole that's at least two feet wider than the root system and about as deep as the point where the roots flare from the trunk (or stems in the case of a shrub). Big Juicy Victoria Plum Tree, 4-5ft Tall, Ready to Fruit, Self Fertile & Juicy. 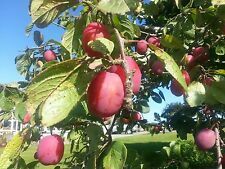 Victoria is a versatile plum tree, producing fruit which can be eaten, used for cooking and for jams.It produces a heavy crop which often needs to be thinned if fruits are to be produced each year. YOU WILL RECEIVE 1 VERY HEALTHY YOUNG MAGNOLIA TREE PLANT WHICH IS GROWING IN A 9cm POT AND IS APPROX 40-50cm TALL. 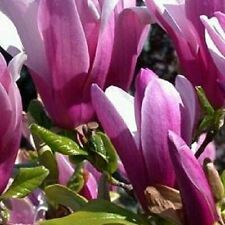 A fantastic variety of Magnolia which has large deep purple flowers in spring and lush deep green leaves. Is the earliest black cherry variety to ripen, a good cropper with a decent fruit size.The fruits ripen in succession, giving two or even three pickings. Beechwood Nurseries are based in N.Ireland and have been growing plants since 1997. Despite their tropical origins, these exotic plants thrive in the UK and are winter hardy to -6. They love a sunny position and are perfect for patio pots. 2 x Phoenix canariensis 70-80cm. Their unique architectural shape and spectacular foliage adds instant dramatic impact to any garden. The apple is a vibrant red in colour and sweet and juicy in flavour with slight hints of strawberry and plenty of acidity. It's best eaten as soon as possible after it's picked. Katy is an easy-going early-season apple. Seen all over Italy, these spectacular architectural conifers will add height and year-round interest wherever you plant them. with their elegant, pencil thin form, they'll look simply stunning framing a door or gateway, or in a terracotta pot. Beechwood Nurseries are based in N.Ireland and have been growing plants since 1997. A vigorus evergreen shrub with oval-shaped bright shiny green leaves.It forms a dense hedge of any height on most soils but not shallow chalk and will give up to 60cm growth each year. W. Naga Noda is a large deciduous climber with twining stems, dark green, pinnate leaves and cascading fragrant clusters of deep violet/blue like flowers. Species:Naga Noda. Dig a hole that's at least two feet wider than the root system and about as deep as the point where the roots flare from the trunk (or stems in the case of a shrub). 2.5-3.5M in 10 years. Glorious young light green/white leaves with a hint of pink variegation on dark red young shoots & revealing striking green stems in winter when the leaves have fallen. Bright golden orange colours in the autumn. Perfect for shrubby borders. 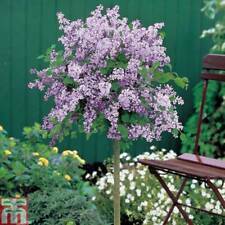 Will grow in any garden in full sun, semi shade or full shade and will grow to approx 6-8ft tall, can also be grown in containers on the patio. Will tolerate most soil types. Stunning Magnolia 'Soulangeana' In 2L pot. Soulangeana is a spreading deciduous tree / large shrub to 6m tall, with leaves to 20cm long, and whitedeeply flushed with rose-pink or violet flowers up to 25cm across in spring. Spherical berries. 'Red Star' has an exotic red coloured leaf which looks excellent in a pot. Hard Landscaping. Nest Boxes. Grass Seed. Colour (Foliage)Red. Plant Food. Plant Support. 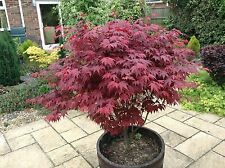 Japanese maples (Acer palmatum) are small, deciduous trees grown for their graceful habit, autumn colour and beautiful foliage which may be coloured or deeply dissected. Softwood cuttings. 'Orange Dream' is a slow-growing and rare small tree with bright-green bark, and orange-yellow foliage that turns yellow in autumn. Big Burlat Cherry Tree - 'Bigarreau Burlat'. 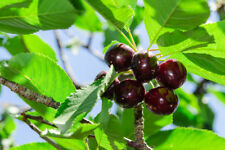 The cherry tree Bigarreau Burlat produces fruit very early, from the middle of May onwards. The cherries are large, dark red and very juicy, they are also sweet and very tasty! With large, deeply ridged, fan-shaped leaves that will spread luxuriously out above the stout trunk, forming an impressive canopy of bright green foliage. Hardy to -5 Celsius, they will over-winter in milder areas or bring inside or wrap when colder. Eucalyptus Gunnii 1-2ft Tall In a 2L Pot. Beechwood Nurseries are based in N.Ireland and have been growing plants since 1997. Also, don't lay mulch on too thick. Just as you did with the soil, build a mulch retaining wall.